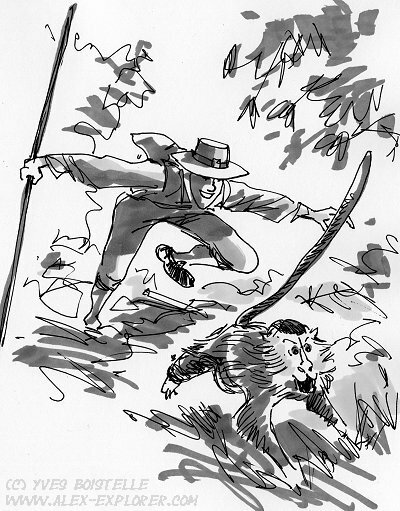 This site is dedicated to the French naturalist and scientist Charles-Alexandre Lesueur, soon also known as Alex the explorer, the hero of a new graphic novel plenty of action and adventure inspired by the incredible wanderings of this courageous early-nineteenth-century traveler. Historians Ritsert Rinsma and Hervé Chabannes in collaboration with the talented artist Yves Boistelle have chosen to tell his life story in several episodes. The first album, entitled The Curse of the Serpent, will be available in June 2007. Moreover, B. R. Rinsma who is finishing a dissertation on Lesueur will be publishing a biography in three volumes. 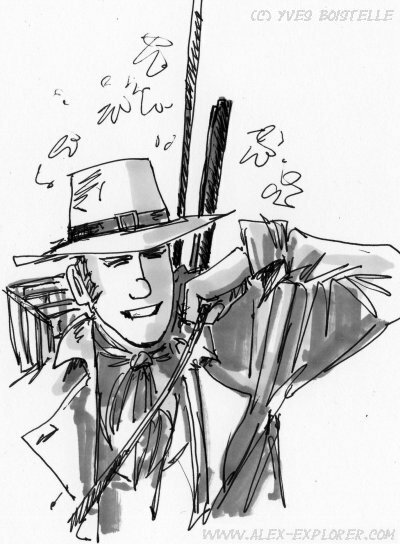 The first is going to be released about the same time as the graphic novel. The other books should follow quickly after that and be available before Christmas 2008. Each work will contain a hundred or so reproductions of drawings by Lesueur who not only was a great explorer but also an excellent draughtsman. What you will find on this web site! The scene is set in August 1944. The allied forces have landed in Normandy. Le Havre is still occupied by German troops. The port is regularly bombed by American and English warcraft. As the explosions get nearer and nearer to the city centre, some couragous volunteers try to save the collections of the Natural History Museum of Le Havre. Part of these are the artefacts given to the city by the French adventurer and artist Charles-Alexandre Lesueur (1778-1846). During the evacuation of the main building we are told the story of this exceptional naturalist who traveled around the world between 1800 and 1837, exploring the South Pacific, Africa, Australia, Indonesia, as well as the Northern Atlantic, England, the Antilles, the USA and Canada. 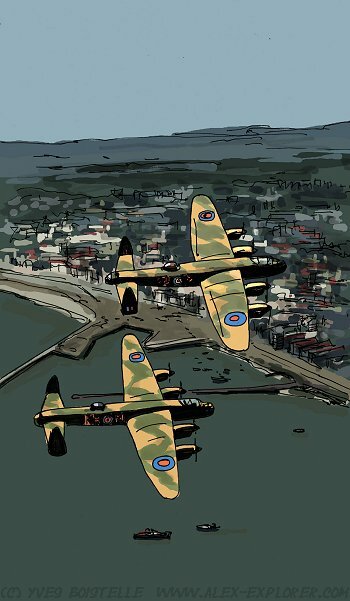 Here are some pictures by Yves Boistelle to appear on the first pages of the graphic novel, showing British Lancasters attacking Le Havre and three heroes of the Museum of Natural History trying to save the collections. Their names are: Michel Marsin, Hervé Furetier and Jeanne Bonnamie. For ten years already historian and scholar Ritsert Rinsma has been trying to reconstitute C.-A. Lesueur's life in all its details travelling from archive to archive around the world. Thus he has found many manuscripts and drawings of the explorer in museums and private collections. 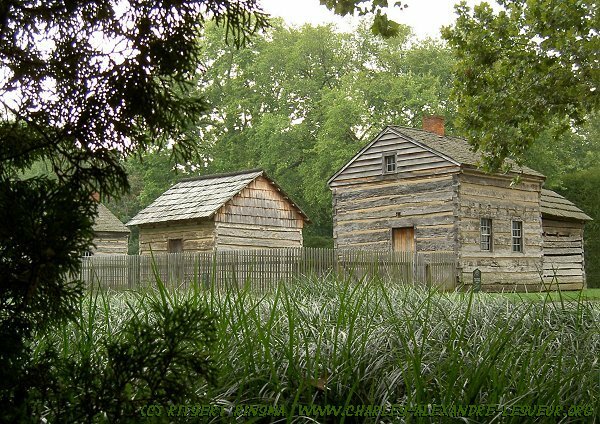 His journeys have also allowed him to make some interesting photo series, notably in New Harmony, Indiana, the utopian village where Charles-Alexandre Lesueur resided between 1826 and 1837.